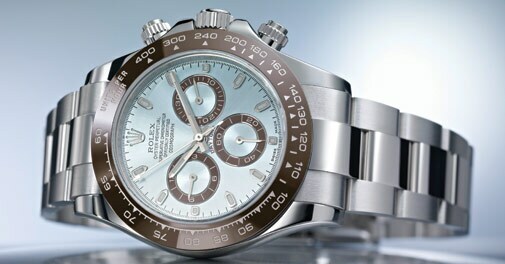 To Commemorate and celebrate 50 years of its launch, the rolex oyster Perpetual Cosmograph Daytona was launched at Baselworld 2013. Made entirely in 950 platinum and equipped with a chestnut brown monobloc cerachrom bezel along with an ice-blue dial, the watch is perhaps the ideal one to measure average speeds of up to 400 miles/hour. Its 40mm oyster case adds robustness and elegance and makes it waterproof to a depth of 100 metres. The Cosmograph Daytona is also equipped with calibre 4130, a certified Swiss chronometer developed entirely by Rolex that makes sure you get perfect precision and stability even when exposed to temperature variations and shocks. What makes this new version of the Cosmograph Daytona even more special is that it is the Official Timekeeper for Formula One as part of Rolex's association with the motorsport event. The watch has been specially designed for all the fans and lovers of motorsport. Price on request.